A somber intro with distorted narrative voice opens lead heavy. 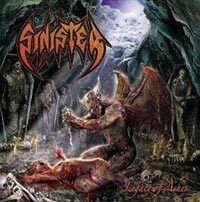 SINISTER will not reduce their heaviness, or the meanness. They have changed and disintegrated but risen again, quite similar sounding apart from the gender differences in vocal styles. Drummer Edwin works hard and it all feels quite ok. I have heard a stronger opener than “Into the Blind World” from this lot though. Aad growls in a husky fashion, sometimes a bit too muffled for me. Alex churns out riff after riff, but turns melodic in the right moments, as in the part before the solo of “The Enemy of My Enemy”. The plucky riffs are all very well thought-out and they have the necessary grooves most of the time. The grooviest moment is probably in the excellent “Anatomie of a Catastrophy”. The title track breathes SLAYER from the start, ominous, mosh-friendly and with a nice refrain it is a highlight. The exceptions on the album are the uninspired “The Hornet´s Nest” and the directionless “The Living Sacrifice”. But all in all this is entertainment on a high level from a born-again band.